This lesson provided by Dave Navarro, ex-guitarist for Red Hot Chili Peppers. Aeroplane is one of the leaner tracks on One Hot Minute. There are only a couple of guitars on this song no more than three. The intro is dou­bled two guitars and played with a clean sound. There’s a little bit of delay and tremolo bar on that part. used a clean sound also. These were played on a Fender Stratocaster, direct into the console. This was one of my custom shop Strats with Texas Special pickups. Incidentally, I’m actu­ally in the process of designing my own Strat right now – the next one will include a high output humbucker. In coming up with these parts I was­n’t necessarily trying to be funky; I was just trying to complement the bass line. In the verses, I used two-note voicings in the chord progression to keep it clean, open and simple (Fig. 1). I play the chorus rhythm parts differently live. On the record, I used these voicings (Fig. 2). They’re four-note chords at the 5th fret. Live, I play the figure at the 10th fret. There are two sections in the Aeroplane choruses where you can hear soloing behind the vocal. These have a different sound – they’re done with a wah-wah pedal and a Boss digital delay box into a Marshall JCM-900 amp, which is is pretty much my normal sig­nal path for leads. In the guitar solo, I saved the fast triplet lick for the end (Fig. 3). I think that sometimes, more than anything else, solos need to shift gears to remain interesting. That was my strategy. I was playing a lot of long, held notes, and needed the contrast. I felt that it was musically necessary to have the change of approach. 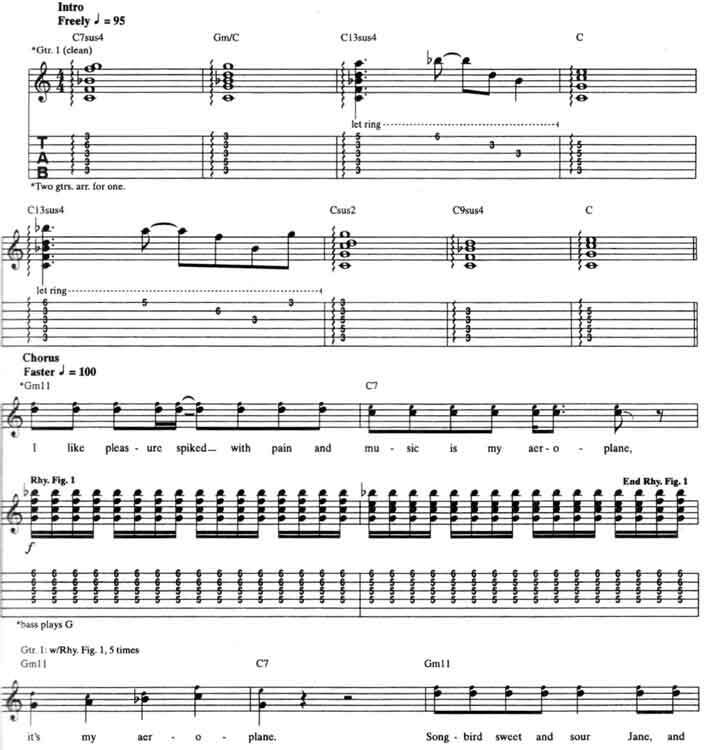 It’s a part of Red Hot Chili Peppers Aeroplane guitar tab and sheet. © 2012 - 2019 TabsClub Powered by TabsClub 42 queries in 0.289 seconds.